The IM proxy log page displays a search-able log of instant messaging conversations and file transfers. 1. Go to Reports > Logs > IM proxy. • Local user filter — Enter the name of a local user whose logged conversations you want to view. • Enable local user filter — Select to display conversations associated with the local user name entered. • Remote user filter — Enter the name of a remote user whose logged conversations you want to view. • Enable remote user filter — Select to display conversations associated with the remote user name entered. • Enable smilies — Select to display smilies in the conversation. • Enable links — Select to make links in the conversation clickable. 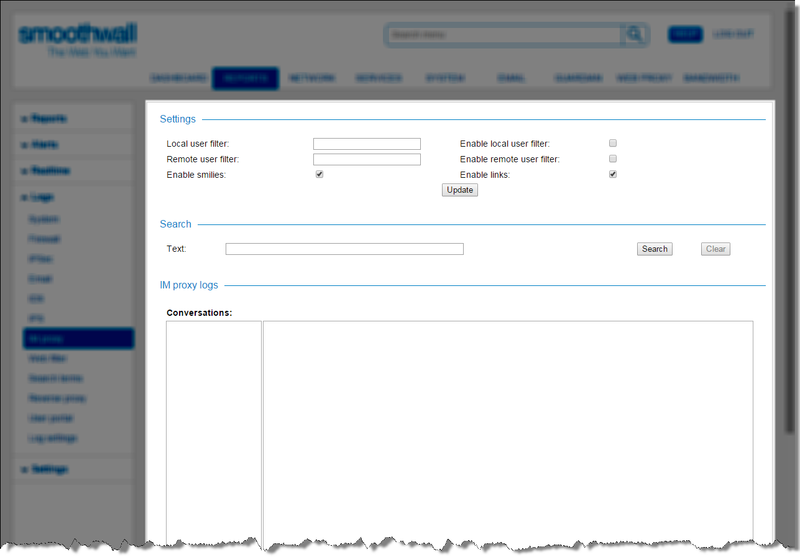 • Search — Here you can enter a specific piece of text you want to search for. • Conversations — Enables you to browse conversations by instant messaging protocol, user ID and date.